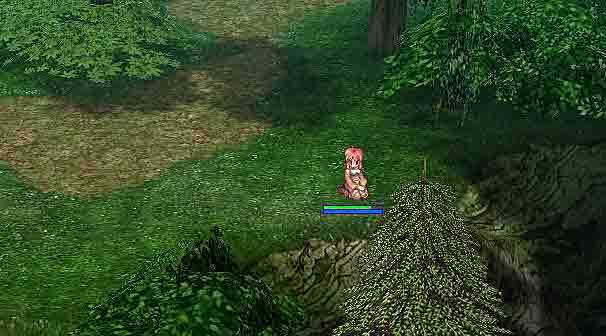 Started playing Ragnarok Online again. I wonder how long it will be this time before I realise the futility of it all? We've also been researching various compression technologies that should help both improve image quality and reduce download size of future games so I've been looking at the various things on offer - Goober has to implement it, so we'll have to see which method he prefers, but Jpeg2000 looks like offering us everything we need: amazing image quality Vs filesize, and support for alpha channels. Managed to find a bit of time one evening to work on the secret gallery. I've just implemented a new menu system for it, so it's much easier for me to add one item, there's a few extra bits and pieces ready for it, so I'll probably make it 'live' in the next few days. I've seen this loads of times on forums (fora? ), and more than a few times in real life. You'll get someone say "I have a great game design", and then following that up with "there's these three kingdoms, and dragons, and a knight", and they tell this long, often hideously cliched, story that involves no game design whatsoever. It's nice to have a story to support a game, and in many cases you need a good story otherwise the game would be a boring slog through a bunch of numbers (adventures and RPGs specifically). But to make a game you need to know how the game is intended to work too. I (like many programmers) hate using other people's code. I wish I could write all the code we need to use myself, but there aren't enough hours in the day as it is and, damnit, I want to play games sometimes too! In this position I'm forced to bite the bullet and plug in some library or other and try to get it working. Sometimes it goes great (the OggVorbis library was *very* simple to drop into Starscape, kudos to those guys), however sometimes it goes incredibly badly and reinforces my hatred of relying on other people's code. The problem seems to be exacerbated with open source libraries (OggVorbis being the exception). I guess if you aren't being paid to code something then there's less of an inclination to polish it to the same level as a professionally built library. Conversely, if someone is going to pay for a library then they'll want documentation etc, and won't be willing to put up with less. I've just finished looking at 3 libraries, 2 open source and 1 proprietary. Both open source libraries had appalling documentation (none in the case of the one lib), and the source was unreadable. The proprietary library had good documentation, although it didn't supply the source code. For any programmer, having the source code can be a lifesaver sometimes. You'll be happily executing your code, when all of a sudden something goes badly wrong inside the library you've plugged in. Surely, if you have the source you can just debug in and see what went wrong? No, not always. Remember me saying those open source libraries had unreadable source? Yep, who knows what was going on. And I can't spend a week working out how the source works just to fix a bug because I can't afford the time. So, one open source library got thrown aside because of a bug in some unreadable piece of code, the other got thrown because it had no documentation, and it didn't even define some of the constants it used in the header files, they were just magic numbers (and that is a mortal sin if ever there was one). The proprietary library just worked (there was a minor glitch, but that was to do with linking and easily fixed), was easy to use and understand (because of the documentation), and unfortunately costs money. As a result we're going with the proprietary solution. Any solution is only good if it saves you time and money in the long run. I apologise for the lack of detail in what I've coded this month but, frankly, it'd be pretty boring to most people, and I felt the need to get these points off my chest. Abnormal service will resume next month. The world simulation (mentioned last month) has developed to a point where I can start working on other aspects of the game necessary to test the simulation itself. This system has to be in place, stable and predictable before anything interesting can happen. People must be born, buildings created, resources mined, units fabricated and armies assembled. Soldiers must be fed, vehicles fueled and reinforcements taken as units are lost. Now that is all basically working some rudimentary AI can go in to stress these foundations and see if anything breaks. This means ramping up the system with hundreds of buildings and units instead of the handful used in initial development. Currently cities grow to feed the demands of each faction's armies, combat over contested free territories increases demand for armies and everything spirals up to a full on war. Which means it suddenly becomes more difficult to analyse and debug so it is time to get some programmer art in there so I can better monitor what is happening. So now we have a rudimentary 2D strategy map and the AI moving armies around to take neighboring free territories resulting in little conflicts that then escalate into major battles. As more free territories are taken access to resources increases and conflicts grow as more and more armies are built and sent in. Reinforcements and supplies stream into the warzone as the weapons fly. If you click on a city the game switches to the 2D battle map which shows the city and surrounding countryside in detail. So far I just have one test vehicle, a little sprite tank. Hundreds of them charge about shooting at each other. Lots of little front lines emerge as groups of tanks line up at maximum weapons range and pound each other. Simple, but it entertains me. I wonder about the battles, they will be the most "C&C like" aspect of the game, the one reviewers will instantly recognise while scrabbling for something to compare us with. As the scope of the game is much much bigger than normal RTS's, the battles will only get a reasonably small percentage of the overall development effort. They are one important part of a bigger game. If people don't "get" that then they will be dissapointed, here is my nightmare review - "I just wanted something like C&C:Generals to play, but the battles are worse than the original C&C! And what is all this other stuff to do with cities, unit building, alliances and politics? Most of the time you aren't even the one doing the fighting, it's your AI commanders!" Well, things will become clearer later when play testing starts and hopefully these fears will prove unfounded for the majority of people. Just as it was getting interesting the 3D code reached a point where it made sense to port the fledgling 2D game across. That all went smoothly but it feels a bit like a backward step as obviously the 2D game now needs a lot of work to get it back to the same level (but in glorious 3D) and the 2D editor needs to be completely redone. Ah well, it will all look sweet when it's fininshed. Argh! - everything has to come crashing to a halt as it's time to look at Starscape, there are quite a few "A" class bugs so we better put Battlescape to one side for a while and sort it out. Hopefully after v1.5 we'll be able to leave Starscape for a good while to make some decent progress on Battlescape. Bingo. If your game concept can't make for an instantly addictive demo, then you need to go back to the drawing board. You know what made me buy Starscape? The demo. Looked pretty, played pretty, figured it'd be worth checking out. That's why I'm very interested to see where the playtesting will go in Battlescape. I still wish you guys were making a Starscape 2 rather than shifting gears but what the hey, beggers can't be choosers. Very true. Hanging great action on a ****** story is a total waste. Better to skip the time wasted on the story and make a straight arcade game instead. I am very pleased to be with you here.